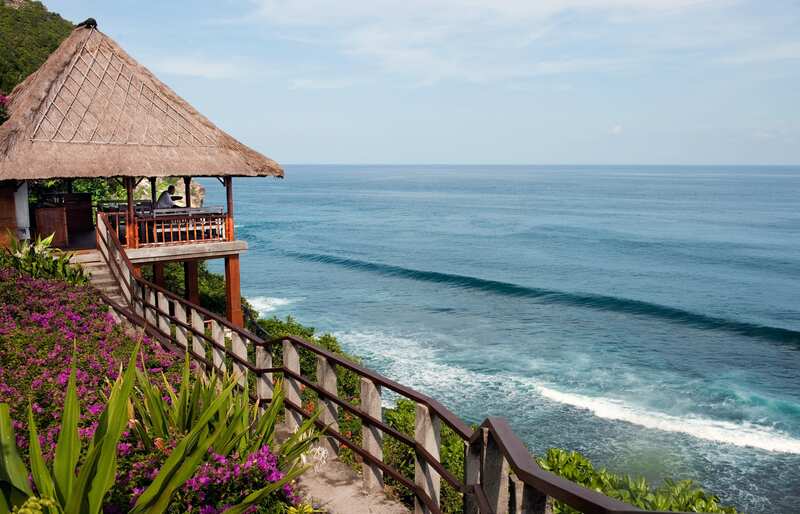 This classic resort had been on our “bucket list” for so long that we shaped it in our imagination into some kind of idealised Balinese archetype. This place, we thought, surely ought to fulfil the expectations of the most spoiled sybarite? Having now visited, we can say: it fulfilled ours. 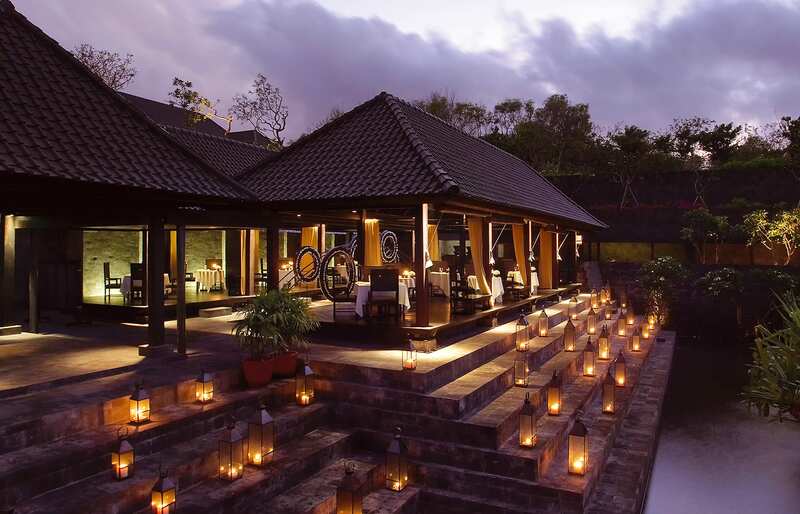 The totality of our expectations concerning Bulgari was finally verified during the latest trip to Bali. 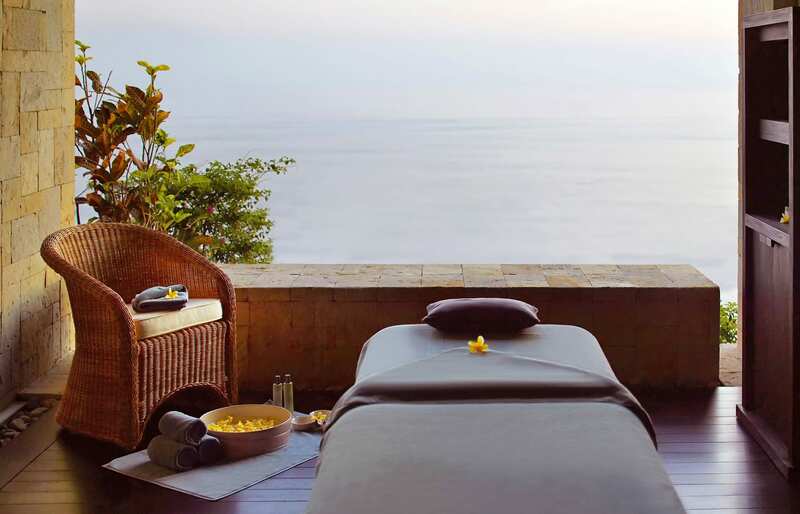 This was the last resort we checked into (after four others: Mandapa Ritz-Carlton Reserve, Four Seasons at Sayan, Amandari, and Amankila) and it was a perfect place to end the Balinese adventure. The real Bulgari certainly matched the imagined one. 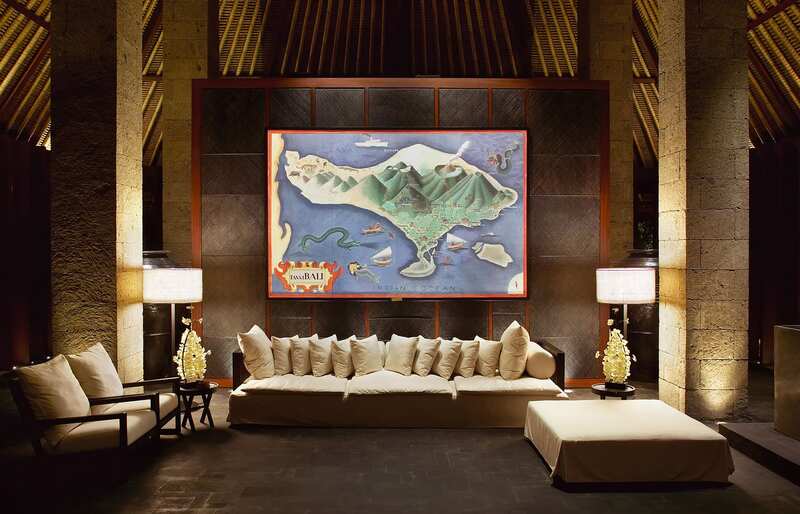 To begin with, we were looking forward to appreciating the resort’s design—and Bulgari does not disappoint. The resort’s designer Antonio Citterio created a place that beautifully blends Italian elegance and local building traditions. We especially liked the villas. 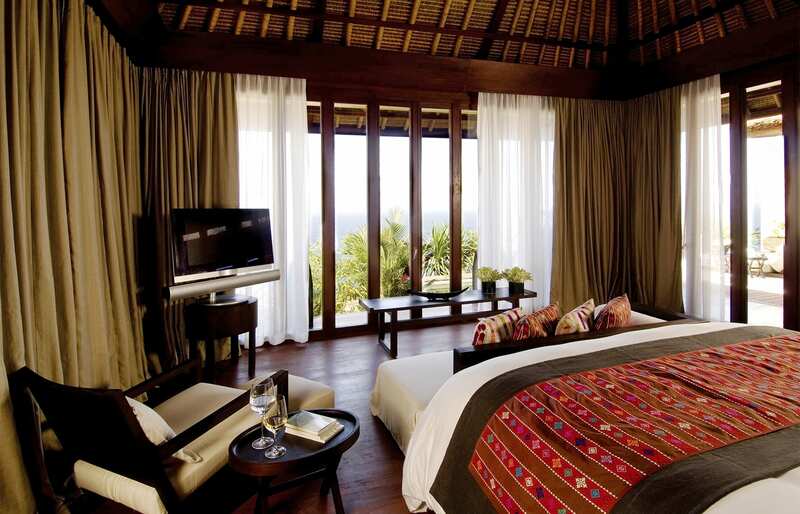 Their large bedroom and equally big bathroom interiors utilise black lava stone, mahogany from Java and sophisticated Balinese fabrics. 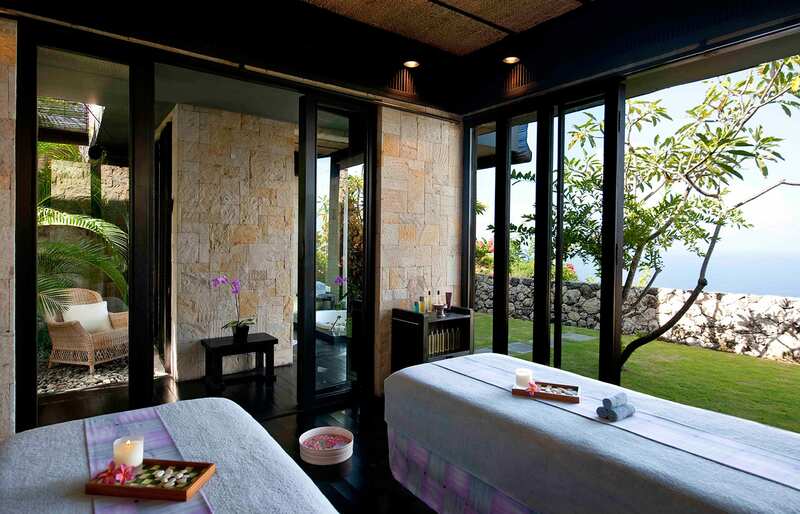 Everything seems polished to a shine—from the wooden floors and neat bricks of the volcanic walls to the floor-to-ceiling glass walls that look out to manicured greenery and beyond, to the ocean. 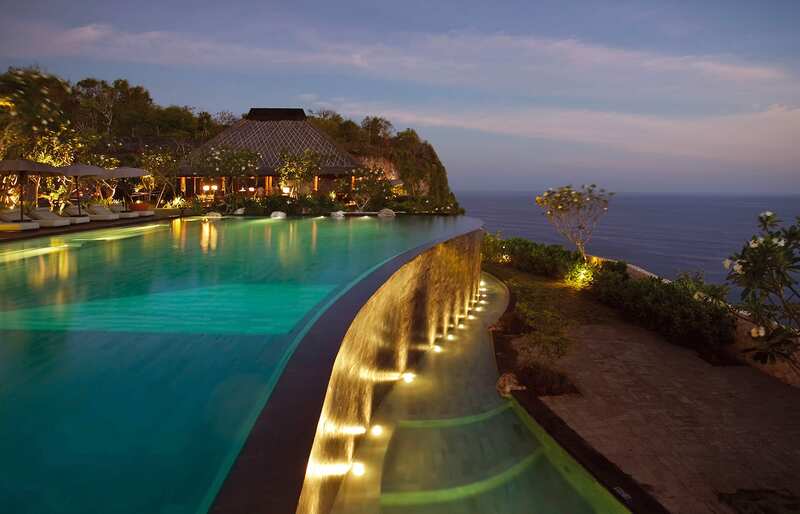 But it is the resort’s striking setting that really stays in memory. 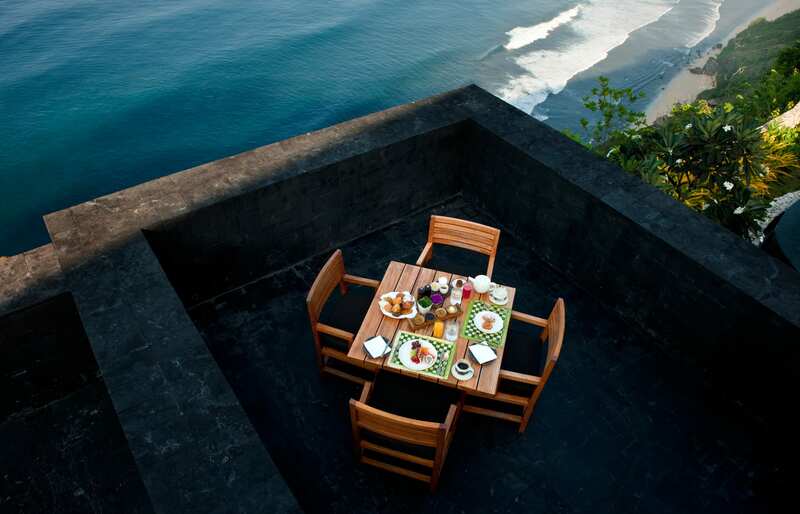 Positioned atop a dramatic cliff, the Bulgari ensures wonderful vistas from pretty much everywhere: from the swimming pool and cliff-edge restaurant area and from most of its 56 private villas. And perhaps especially from the unique inclined elevator, which is a one of the kind lift that slides on the cliff’s slope to a secluded beach. 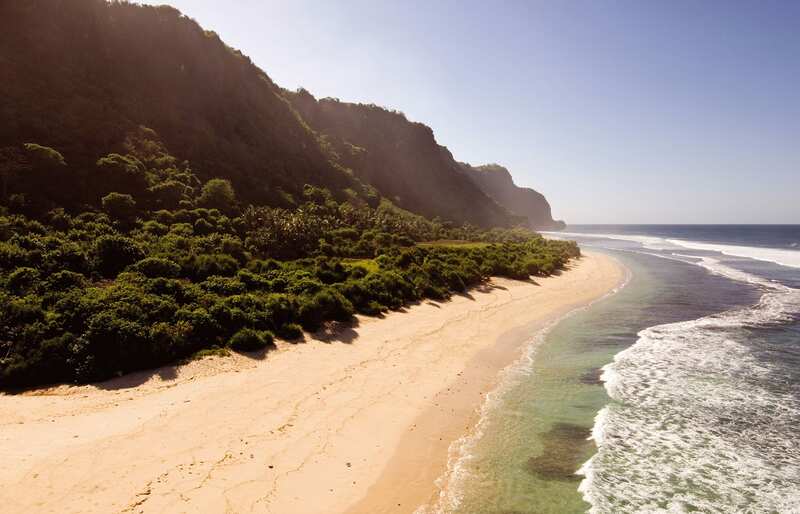 The resort’s beach is not very big and it gets overwhelmed by a roaring sea at high tide, but it opens to a vast and deserted public beach, which we, of course, traversed, all the way to a lone old shipwreck, just over a kilometre from the resort. 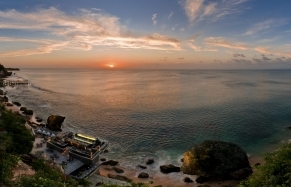 The hotel’s location ensure beautiful sunsets, which we’d wait for while sipping drinks in the clifftop bar. We loved to gaze at the sea in the fading light of the day until its dark expanse got dotted by dozens of spotlights from fishing vessels luring squid to the surface. This was the perfect prelude to a romantic dinner at the award-winning Il Ristorante, where we had the chance to try the sublime creations from the Italian Chef de Cuisine Nicola Russo. 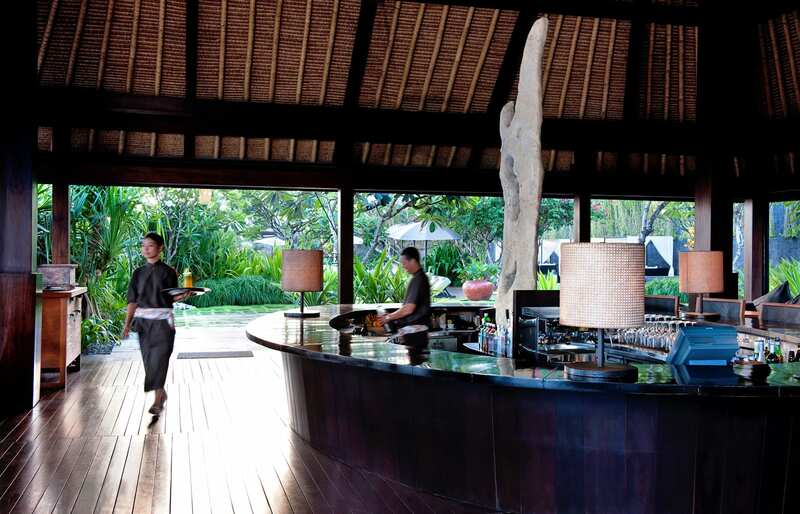 The pool, bar and restaurant areas are gracefully incorporated into landscaped hotel grounds. 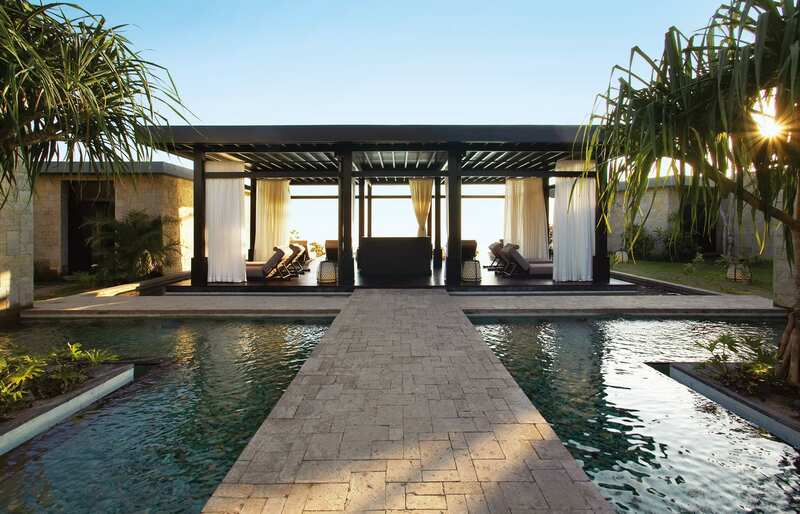 The beautiful gardens and pathways are sprinkled by mature frangipani and acacia trees. Only occasionally the hotel introduces an element somewhat at odds with the surroundings. 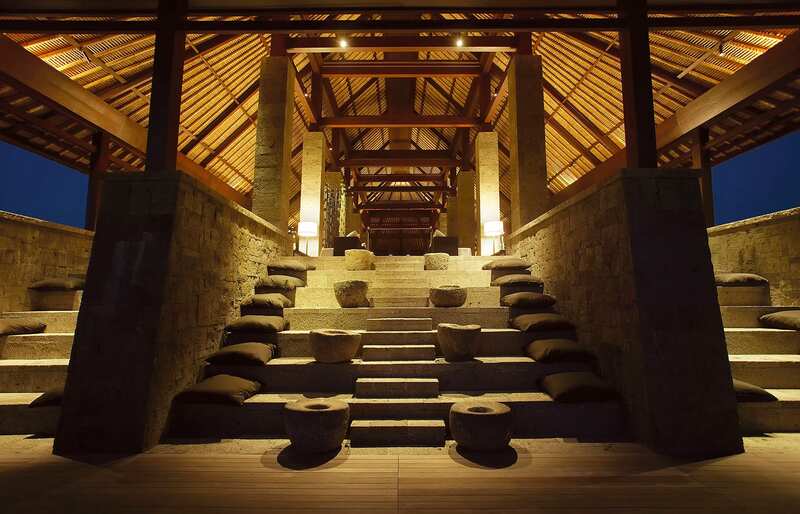 The spa is housed in a historical house imported from Java (wonderful spa treatments by the way! ), which works well in context. 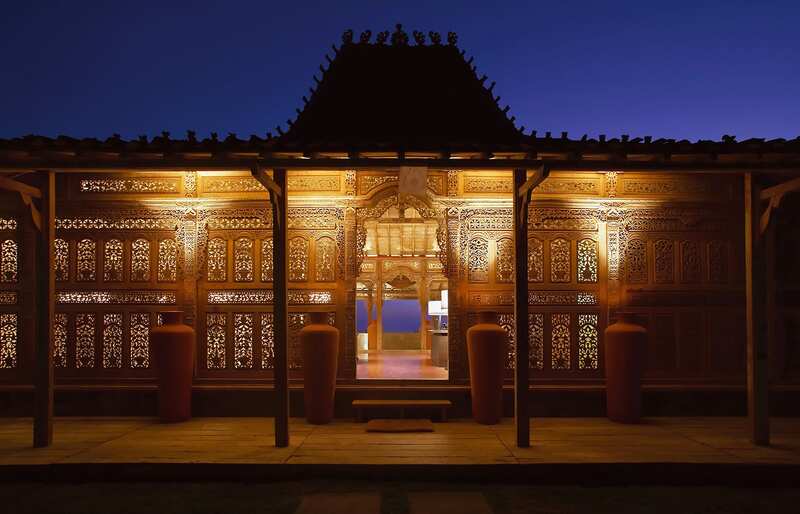 But the sleek form of the wedding chapel seems to pay homage to the deconstructive architecture more than Balinese building traditions. It is nothing if not impressive though and it brings to mind contemporary design in Italy. Maybe this what makes the Bulgari take on luxury so attractive. 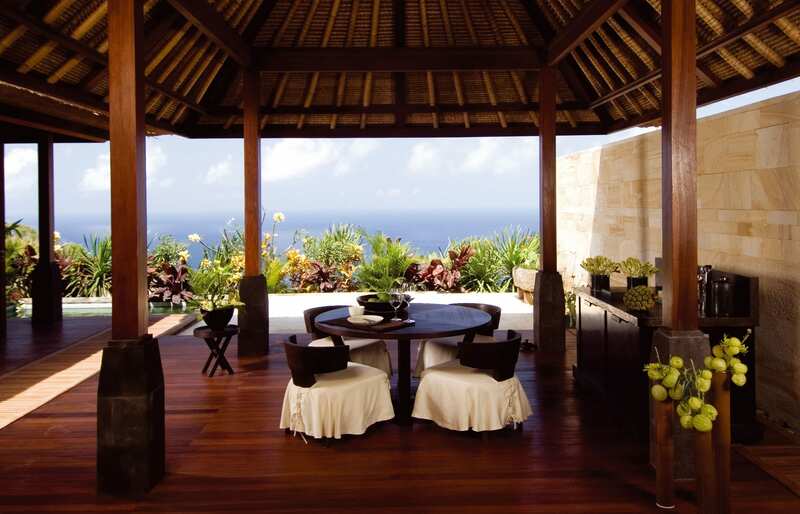 For us, the resort has always evoked images of sophisticated Balinese luxury, but only by visiting it we discovered strong traces of European DNA. In any case, it all results in a very compelling end product. 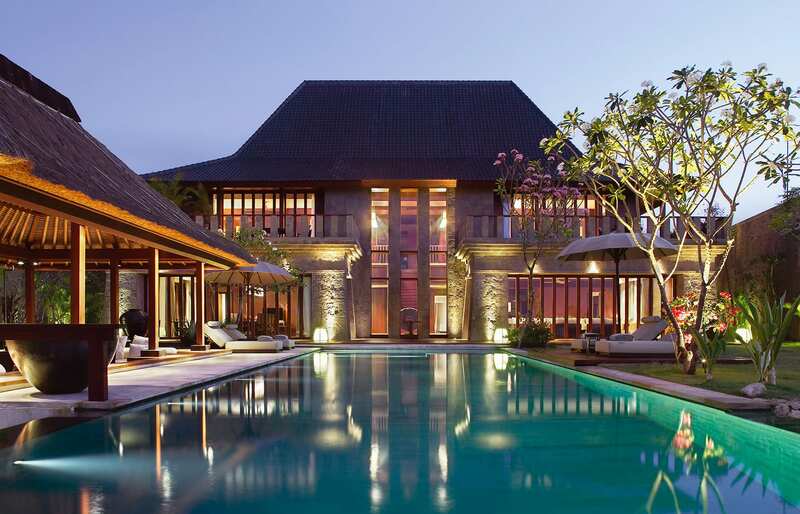 The Bulgari reputation as one of the best high-end properties on the island is well earned. 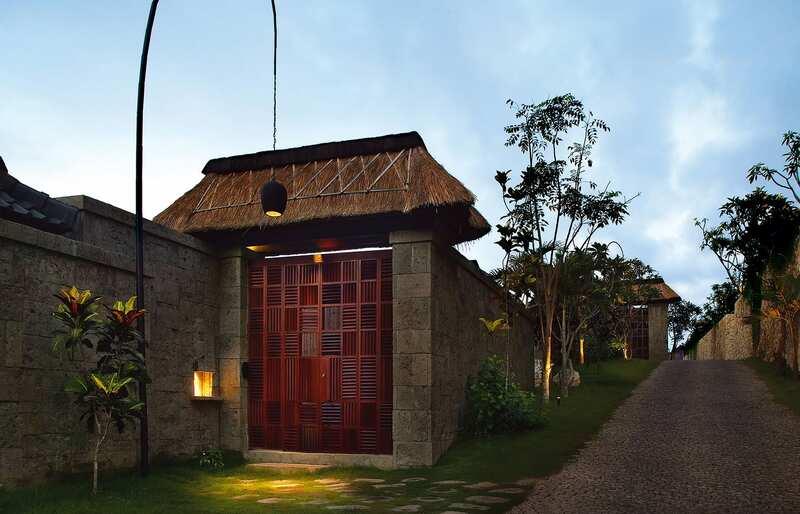 Bulgari Bali is an example of a five-star hotel that is authentically rooted in its location without forgoing glitzy luxury. 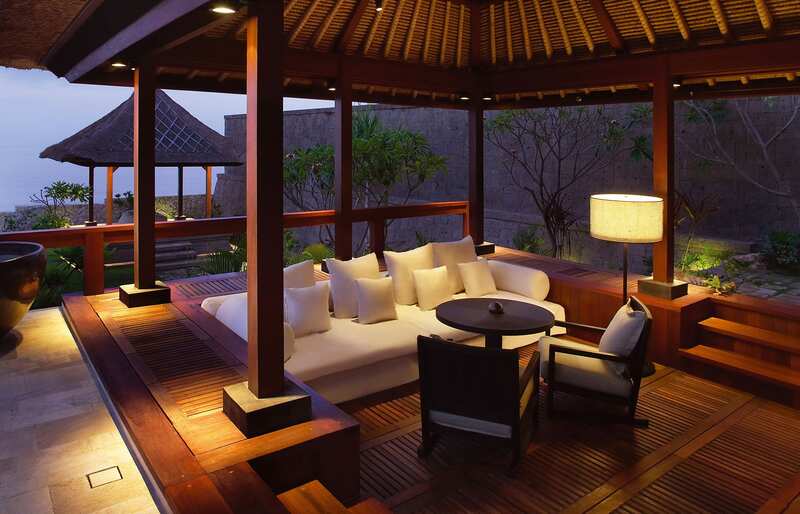 It sets its own benchmark in a sublime mix of Italian contemporary design and traditional Balinese style. 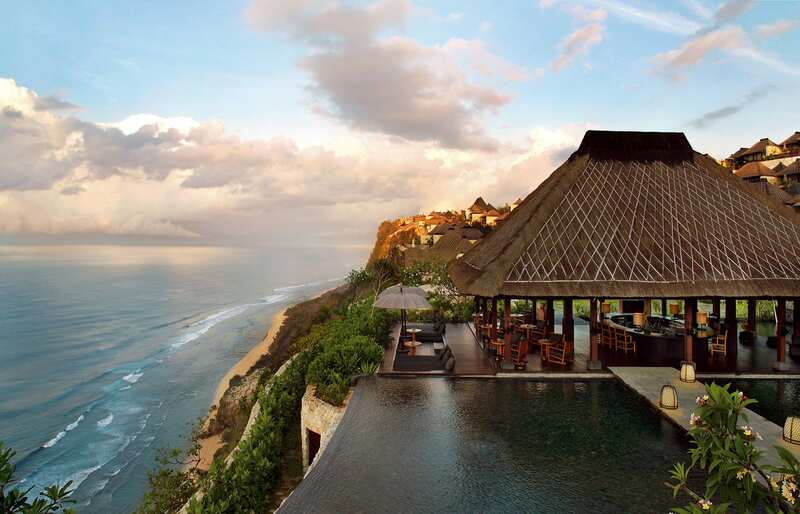 Spectacular location: perched high on the cliffs of Uluwatu, Bulgari offers breathtaking views that are impossible to resist—and neither is the secluded beach at the bottom of the cliff. Speaking of which: the beach experience! It starts with the inclined elevator ride that takes guests to the beach club. It's one of the longest rides of its kind in the world, with fantastic views from its open-sided carriage. It stops near the beach club restaurant, around which you are likely to encounter a troop of monkeys. Overall hotel grounds and architectural mashups. 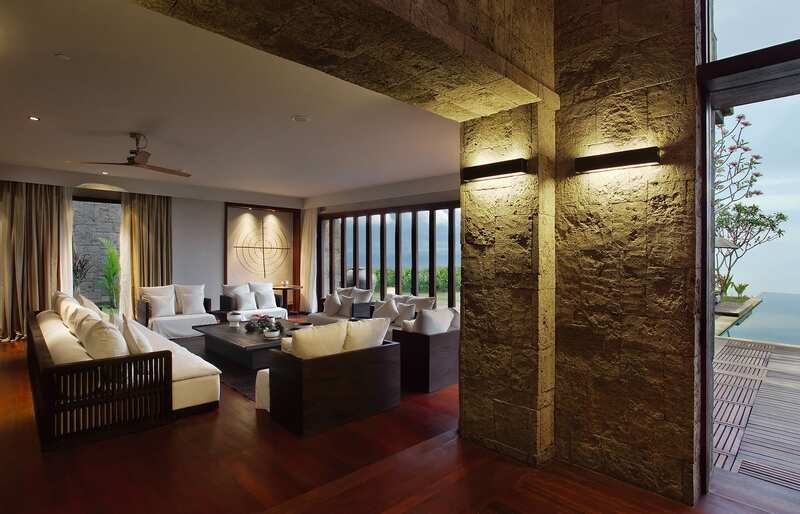 Beautiful landscaping includes natural patterns and textures created using grass, wood, rough stone and polished volcanic lava. They contribute to a heavenly ambience, in which a simple walk seems to bring about a state of mindfulness. 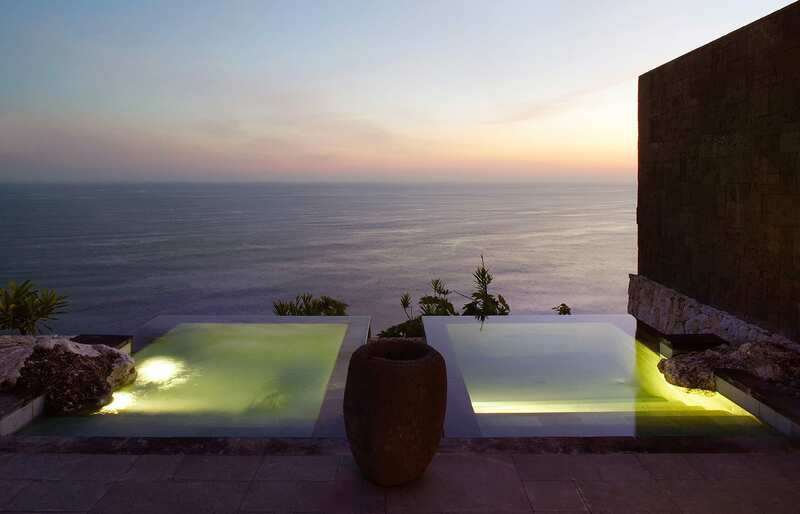 The main hotel infinity pool is one of the most spectacular we've been lucky to enjoy. 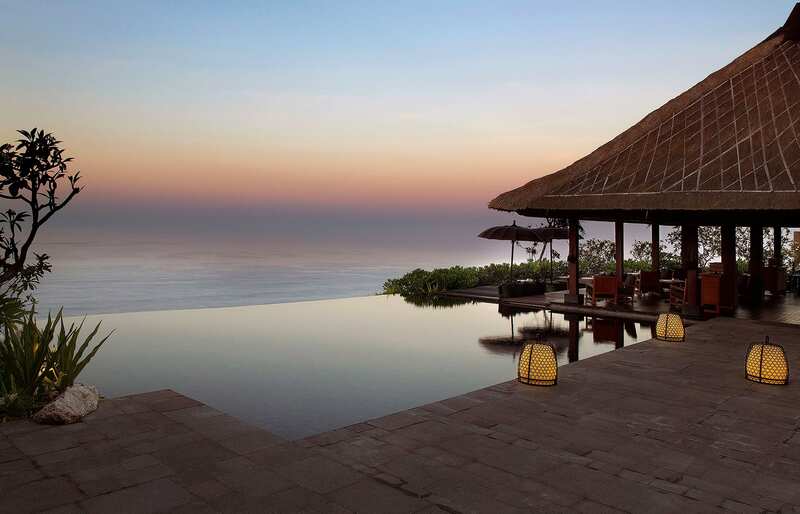 The very sizeable pool is surrounded by private gazebos. 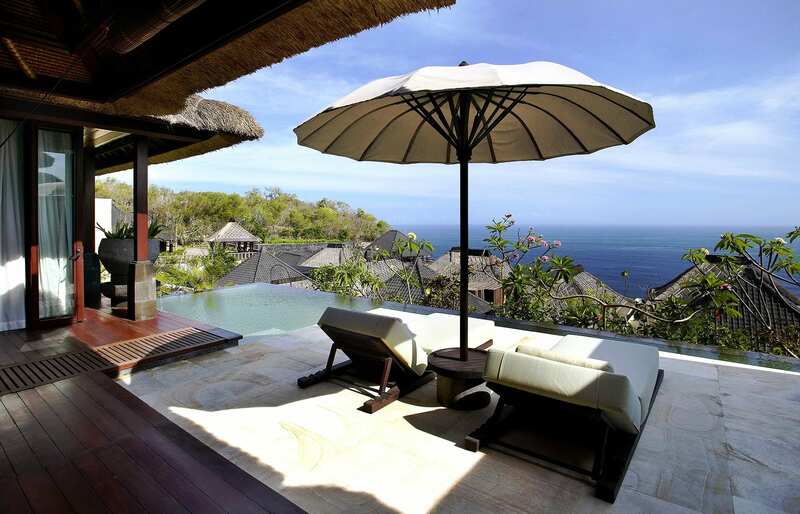 The area never feels crowded by the guests (there is a small number of villas after all), so it's always easy to get a daybed. 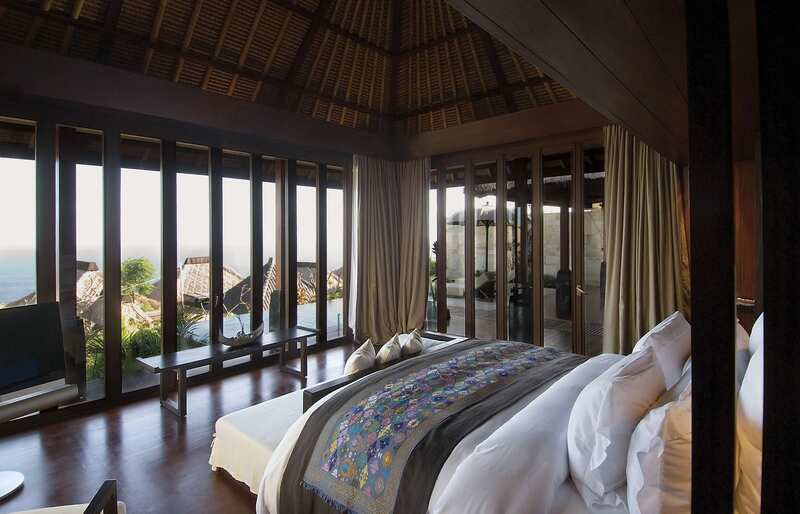 The guest villas. 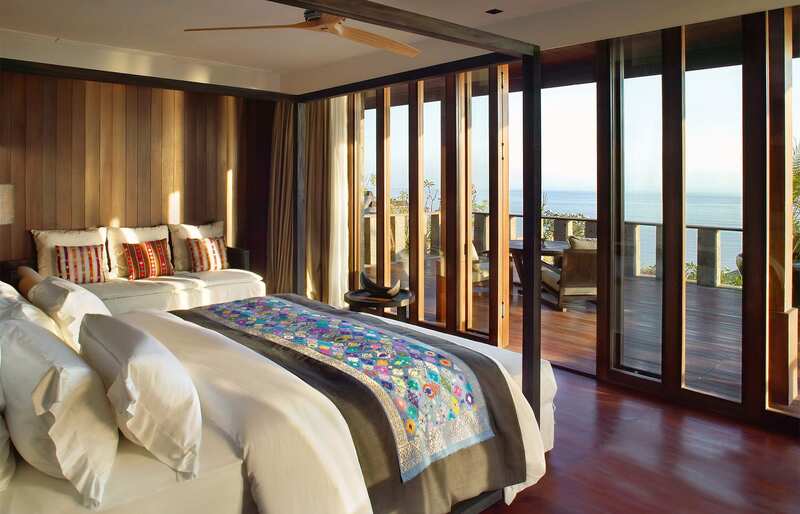 Superbly comfortable, with the bedrooms and bathroom of equal size, surrounded by full-length windows. 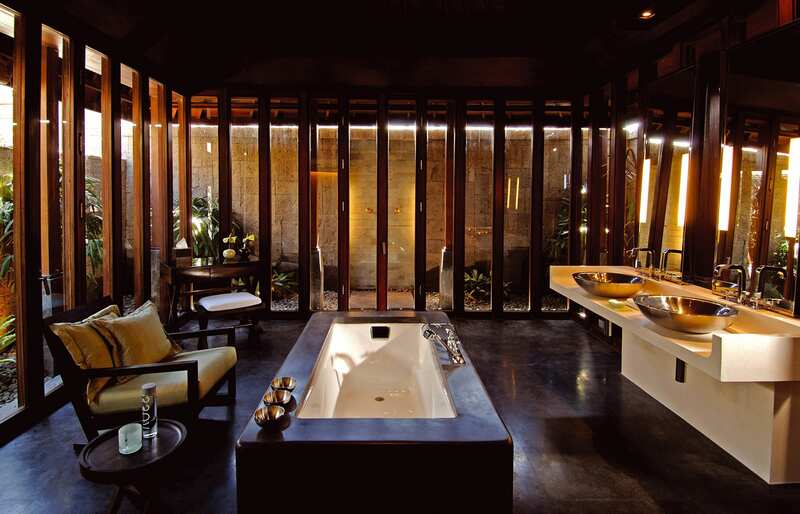 Superb bathroom amenities, of course from the Bulgari luxury cosmetics brand. Il Ristorante: everything from the interior design and ambience to the fantastic art-on-a-plate food. 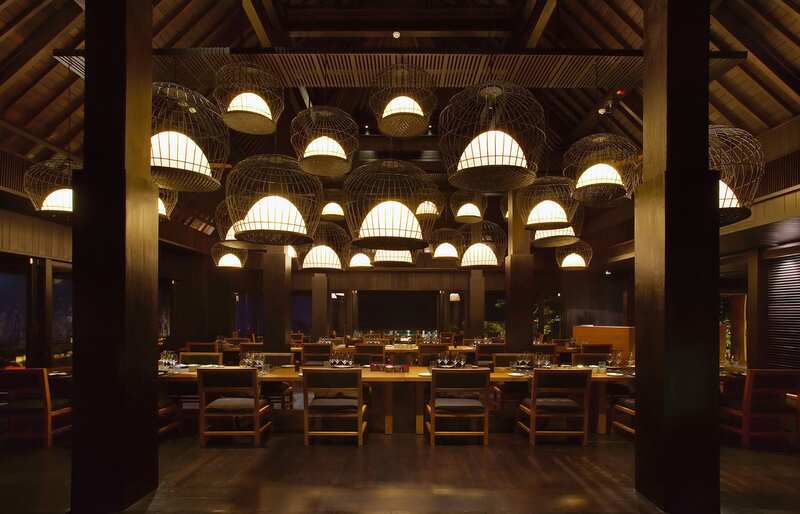 Well recommended to book for a truly special dinner—even if you’re not staying at Bulgari. Before dinner make sure to pop for sundowners to the bar. The sunsets are unreal! 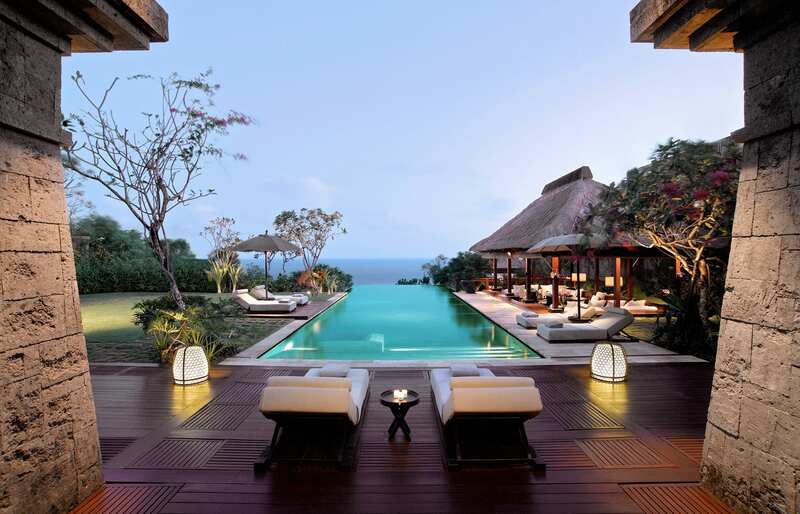 At the time of our visit the hotel was readying itself to celebrating its 10th anniversary and the villas were scheduled to undergo a renovation. And frankly, they needed it. The lift does not stop directly down on the beach. There are a lot of steps to traverse to get to the bottom, which may be a problem for guests with mobility issues. At the very least you should be able to get the Beach Club Restaurant, which has great views—and the food. Don’t try to go swimming in the sea. The tides along this stretch of coastline can be treacherous. Ultimately this has not spoiled our stay, but something has to be said about the outside visitors. It would be fine if the hotel just accepted limited restaurant reservations from outside, but every day there were literally busloads of tourists brought to the resort, and at some point the clamorous crowds in garish attire and with their endless selfies grows tiresome for the staying guests… especially when they try to relax by the infinity pool. We do understand this phenomenon is not unique to Bulgari. Related to the above, we had to make a reservation just to have sunset drinks in the bar. Bulgari is a business and serving as a wedding venue makes a very good business sense, but during our few days at the resort, a new wedding was taking place almost every day. It meant that at certain hours using some common areas was impossible. 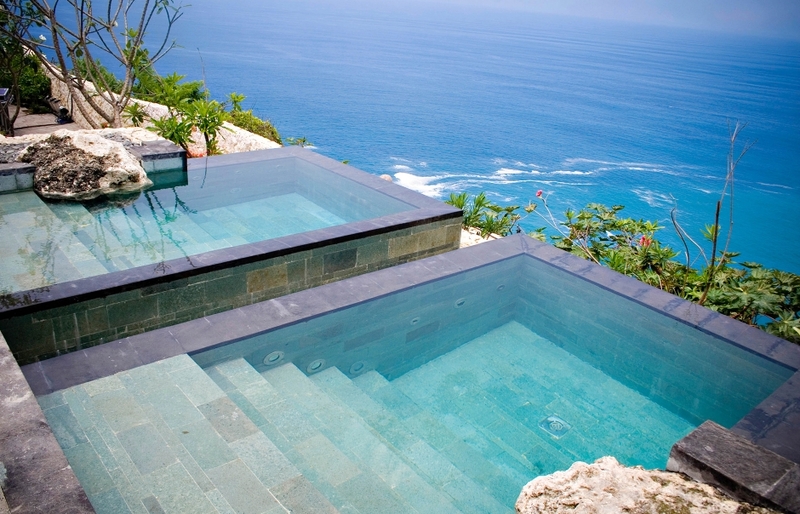 The private plunge pools in the villas are rather small. They are great for cooling off on a hot day, but if you want to stretch and have a proper swim head to the resort's vast infinity pool. The Il Ristorante is open in the evening only, and seats only 36 guests, so book in advance.